The Climate Change (Emissions Reduction Targets) (Scotland) Bill has recently completed its first stage in the Scottish Parliament. The purpose of the bill is to amend the Climate Change (Scotland) Act 2009 to make provision for setting targets for the reduction of greenhouse gases emissions and to make provision about advice, plans and reports in relation to those targets. Research briefing by SPICe (Scottish Parliament Information Centre). 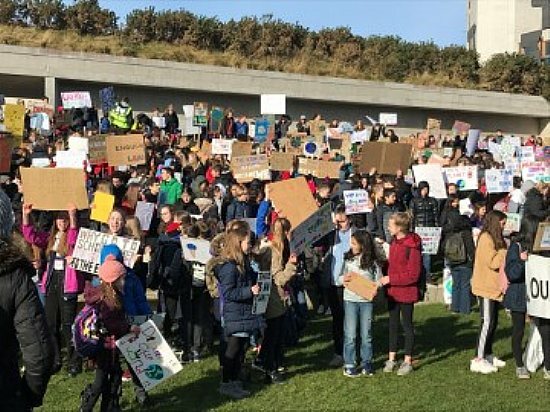 The Environment, Climate Change and Land Reform Committee will hear from 13 young people, aged 7 to 17, to find out what motivated them to take part in the protest as well as what actions they think Scotland should take in order to stop climate change. The young people, who will be coming from across Scotland, will take part in an informal meeting with the Committee on Tuesday 2 April 2019. As well as meeting with members of the Committee, the young people will also meet the Intergovernmental Panel on Climate Change (IPCC), the United Nations body for assessing the science related to climate change. The IPCC is visiting the Parliament to speak to the Committee about their work, the opportunities and challenges of tackling climate change and the Climate Change Bill being debated in the Parliament later that afternoon. Members of the IPCC will meet the young people before having discussion with the Committee. “The passion and the commitment of the young people has been inspiring. 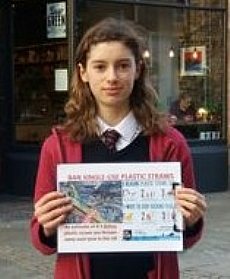 The impact of climate change will affect their generation most, so it is understandable that they want to see change and they want to see it quickly. “We are looking forward to meeting these young people to find out more about what inspired them to take part in this global movement and what they are doing to ensure that their voices are heard loud and clear. “By having the opportunity to meet the IPCC at the Parliament, the young people will meet with those whose job it is to advise governments across the world on ways to mitigate climate change. The meeting takes place on the same day as the Parliament will debate the Climate Change (Emissions Reduction Targets) (Scotland) Bill. In its Stage 1 report, the Committee called for greater urgency to stop global temperatures rising to dangerous levels. Following the meeting the Scottish Parliament will consider the issues raised as part of its consideration of the Climate Change Bill. "Moran said climate change had not been debated in the main chamber of the House of Commons for two years. She spoke, however, to a chamber where the seats were predominantly empty. 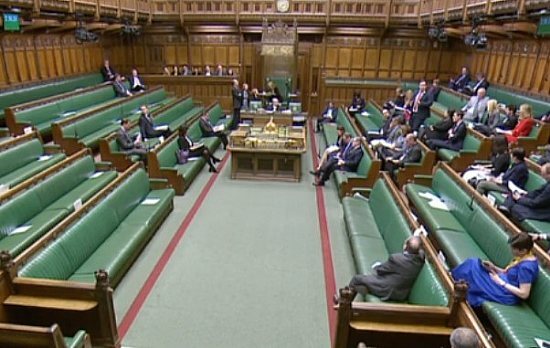 At points, as few as 10 MPs sat on government benches, although the opposition side was more occupied. 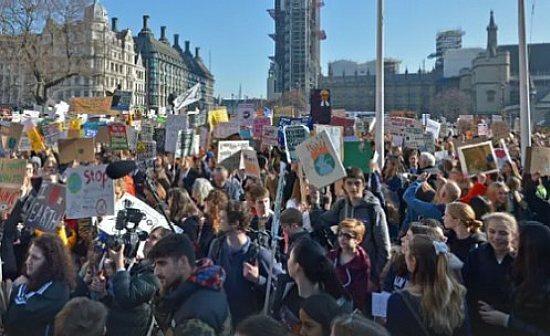 The lacklustre response to the debate from the government was in stark contrast to the condemnation by Downing Street to the thousands of children involved in the strike for climate change, calling it 'truancy'." Her last statement seems to be wrong. Rather, the government's and MP's indifference to the debate seems to be wholly in tune with the government's condemnation of the school and student protests. Scotland could become net-zero for greenhouse gas emissions by 2045, according to a new report published by WWF. ‘A Climate of Possibility: Harnessing Scotland’s natural resources to end our contribution to climate change’ sets out the many routes Scotland can take to reach net zero greenhouse gas emissions. Scotland has multiple options to confidently end its climate emissions by 2045 according to a new report published today. ‘A Climate of Possibility: Harnessing Scotland’s natural resources to end our contribution to climate change’ commissioned by WWF Scotland sets out the many routes Scotland can take to reach net zero greenhouse gas emissions . We need to accelerate our response to climate change while at the same time planning a just transition towards a healthier, cleaner, flourishing country. “We know that climate change is one of the biggest threats facing people and nature. To avoid the most dangerous consequences at home and abroad, we need to urgently cut our emissions and rapidly increase our carbon sinks through tree planting, restoring peatlands and improving the health of our soils. “In the ten years since the previous Climate Change Bill we’ve already reduced emissions by nearly half and made truly incredible progress in cutting the carbon from our power sector. “There’s still much to be done to ensure everyone in Scotland is living in a warm, low carbon home, can breathe clean air and that we are producing the best of low carbon food. “That’s why it’s crucial MSPs, who are debating the new Climate Change Bill, confront the challenge head on and join the growing number of progressive nations by setting an iconic net zero target and speeding up the policy action need to end our climate emissions once and for all. 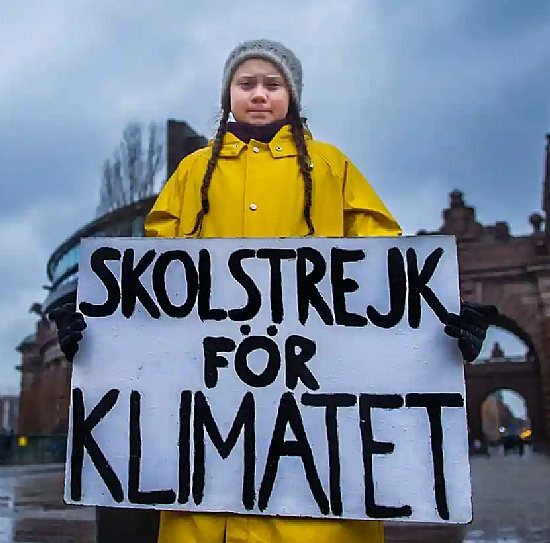 The Swedish teenager, now 16, who hit the headlines by leading school strikes against climate change and addressed the UN Climate Conference in Katowice in December, has taken the train to Davos to tell the political and business leaders gathered for the World Economic Forum "Our house is on fire . . . I don’t want you to be hopeful. I want you to panic. I want you to feel the fear I feel every day. And then I want you to act." See also a TED Talk given by Greta in Stockhom in late 2018. ECOLISE is the European Network for Community-Led Initiatives on Climate Change and Sustainability. "You say you love your children above all else, and yet you are stealing their future in front of their very eyes." 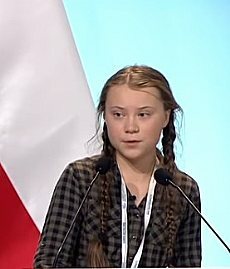 View the video and read the read the full text of her speech to the climate conference. The commonest reaction to the outcome of the COP24 climate change talks in Katowice, Poland, which ended last Saturday 15 December, seems to have been one of relief that a degree of agreement was reached on writing a 'common rulebook' to implement decisions made in principle at the COP21 Paris talks in December 2015. The main requirement of the rulebook agreed so far is that all countries will have to report their emissions – and progress in cutting them – every two years from 2024. However agreement could not be reached over carbon credits, which are awarded to countries for their emissions-cutting efforts and their carbon sinks, such as forests, which absorb carbon, and which count towards countries’ emissions-cutting targets. Owing to insistence by Brazil on wording which others felt would operate unfairly to its advantage, this issue has been put off until next year. Another contentious issue was whether the conference should 'welcome' or merely 'note' the recent report by the Intergovernmental Panel on Climate Change on the urgent measures required to limit the global rise in temperature to 1.5 degrees. "All nations have worked tirelessly. All nations showed their commitment. All nations can leave Katowice with a sense of pride, knowing that their efforts have paid off. The guidelines contained in the Katowice Climate Package provide the basis for implementing the agreement as of 2020." Michal Kurtyka, President of COP24, and Polish energy minister. "This is an excellent achievement! The multilateral system has delivered a solid result. This is a roadmap for the international community to decisively address climate change. The guidelines that delegations have been working on day and night are balanced and clearly reflect how responsibilities are distributed amongst the world's nations. They incorporate the fact that countries have different capabilities and economic and social realities at home, while providing the foundation for ever increasing ambition. While some details will need to be finalised and improved over time, the system is to the largest part in place." Patricia Espinosa, UN climate chief. "Three years after the wedding announcement in Paris, this COP was about negotiating the nuptial contract in detail. It's been a technically challenging COP, focused on negotiating the implementation rules of the Paris Agreement. But acknowledging the scale of this task should not hide that countries lacked the political will to strongly support stepping up efforts to reduce their emissions. Countries now need to wake up to the IPCC alarm and start or continue national and collective processes for more ambition. The UN secretary general, together with the Chilean COP25 presidency, with support from Costa Rica, must all actively drive these efforts." Lola Vallejo, climate programme director, Institute for sustainable development and international relations. "A year of climate disasters and a dire warning from the world's top scientists should have led to so much more. Instead, governments let people down again as they ignored the science and the plight of the vulnerable. Recognising the urgency of raised ambition and adopting a set of rules for climate action is not nearly enough when whole nations face extinction. "Without immediate action, even the strongest rules will not get us anywhere. People expected action and that is what governments did not deliver. This is morally unacceptable and they must now carry with them the outrage of people and come to the UN Secretary General's summit in 2019 with higher climate action targets." Jennifer Morgan,executive director, Greenpeace International. The Guardian - Editorial summary and What was decided? The naturalist was chosen to represent the world’s people in addressing delegates of almost 200 nations who are in Katowice to negotiate how to turn pledges made in the 2015 Paris climate deal into reality. . . . "Right now we are facing a manmade disaster of global scale, our greatest threat in thousands of years: climate change," he said. "If we don’t take action, the collapse of our civilisations and the extinction of much of the natural world is on the horizon." "The world’s leading climate scientists have warned there is only 12 years to keep global warming to a maximum of 1.5C and avoid catastrophic environmental breakdown. "The authors of the landmark report by the UN Intergovernmental Panel on Climate Change (IPCC) said urgent and unprecedented changes are needed to reach the target, which is affordable and feasible although it lies at the most ambitious end of the Paris agreement pledge to keep temperatures between 1.5C and 2C. "The IPCC global warming report spares politicians the worst details - the dangers if governments ignore efforts to limit warming to 1.5C are more grave than the summary makes out." "The Climate Change (Scotland) Act 2009 set world-leading greenhouse gas emissions reduction targets, including a target to reduce emissions by 80% by 2050. "The Scottish Government intends to introduce a new Climate Change Bill with even more ambitious targets. Proposals include setting targets based on actual emissions, increasing the 2050 target to 90% emissions reduction, and making provisions for a net-zero greenhouse gas emissions target to be set when the evidence becomes available. "A number of technical amendments designed to improve the transparency of the targets and functioning of the Act are also being considered". 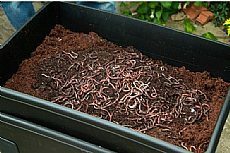 the EU Emissions Trading System. exactly that. These proposals are intended to provide certainty to investors, businesses and communities and to create the conditions to maximise opportunities to export our technology innovations and knowledge as other economies make their own low carbon transition". The Environmental Report referred to in Part 5 of the Consultation Paper is available here. If you wish to take part in the consultation you will find instructions on how to respond (by answering specific questions) at Annex C of the consultation paper. Responses can most conveniently be submitted online. If you respond by mail or email you are required to submit a Respondent Information Form, available here. The Scottish Government published its draft Climate Change Plan, containing policies and proposals for the period 2017 - 2032, and opened it for consultation until 10 February (which doesn't give much time to read and digest a 178 page document). TBI Convenor Martin Sherring noted that this plan was open for consultation until 10 February, and has now submitted a TBI response. Dr Philip Revell, Projects Co-ordinator for Sustaining Dunbar, has referred us to two other responses, from Sustaining Dunbar and the Scottish Communities Alliance. 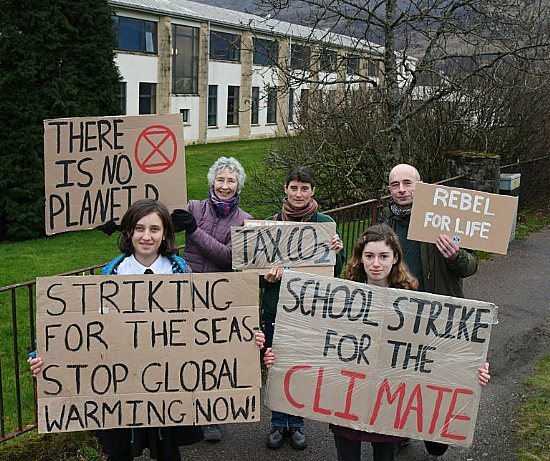 What all these responses have in common is an emphasis on the failure of the Scottish Government's draft plan to recognise the importance of the part that local community action must and can play in combating climate change. The UN climate change secretary has praised Scotland's progress on climate change as "exemplary". The Climate Change Act, passed in 2009 by the Scottish Parliament, set binding targets to cut emissions for each year until 2020. Christiana Figueres told BBC Scotland that, despite the Scottish government not meeting its interim targets, she was impressed by the pace of change. Few people today would dispute the global scientific consensus that climate change is one of the greatest challenges of the 21st century, impacting on billions of people and ecosystems worldwide. Policy debate on reducing carbon emissions generally tends to focus on the quest for technical solutions that can reduce and eventually replace fossil fuels with cleaner energy. While that is clearly a key objective in the drive to combat global warming, there is growing recognition that natural solutions to climate change mitigation and adaptation should receive more attention. Almost two thirds of residents in the Highland Council area believe that climate change is an immediate and urgent problem according to a survey of the Council’s Citizens Panel. 66.4% of 989 respondents expressed this attitude towards climate change. This is an increase from 53.8%, which was recorded in a similar survey conducted by the Council in 2011. The survey also revealed that 87.2% of 1,027 respondents felt that climate change is either partly, mainly, or entirely caused by human activity. Beyond Paris: Are we Ready? Whatever your view on its shortcomings, the agreement in Paris makes it official: the era of fossil fuels is at an end. And the quicker we can bring it to an end, the more reserves of coal, oil and gas can be kept in the ground and the better chance we have of avoiding the most catastrophic consequences of climate change. This will require a transformation in the way we live our lives and run our economy and gives us an historic, one-off opportunity to move away from our fossil-fuel conditioned mind-set with its focus on centralised, large-scale solutions and to re-imagine the way we do things. With an economy and society based on dispersed, diffuse, decentralised renewables, can we grasp the opportunity and empower our communities to take control of shaping their own futures? How can we ensure that our communities are resilient enough to use the multiple economic, social and environmental challenges ahead as stimuli for creative change? 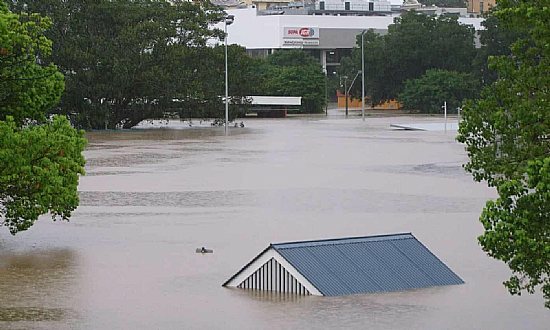 See here for some thoughts on what makes for a resilient community. The recent floods in the Scottish Borders and Cumbria have once again highlighted our changing weather patterns and the increased frequency of prolonged intense rainfall. Scottish Communities CAN is currently working with Adaptation Scotland to refine and develop a simple resource (‘Are We Ready?’). Starting from the premise that we all like to talk about the weather, and how it is changing, the intention is to make this available as a resource for our members to use as a way of engaging people who wouldn’t normally come to a meeting to discuss climate change. We hope it can also lead these conversations beyond short-term responses to emergencies to discuss long-term community resilience. We are still seeking a few communities to host an ‘Are We Ready?’ workshop as we finalise the resource. Please do get in touch if you are interested. LE BOURGET, France 12 December 2015 — Representatives of 195 countries reached a landmark climate accord on Saturday that will, for the first time, commit nearly every country to lowering planet-warming greenhouse gas emissions to help stave off the most drastic effects of climate change. Delegates who have been negotiating intensely in this Paris suburb for two weeks gathered for the final plenary session, where suddenly, Foreign Minister Laurent Fabius of France asked for opposition to the deal and, hearing none, gaveled the session closed. With that, the delegates achieved what had been unreachable for two decades: a consensus on the need to move away from carbon-based fuels and a plan for the 195 nations to do so. Though the final deal did not achieve all that environmentalists, scientists and some countries had hoped for, it set the table for further efforts to slow down the slide toward an unlivable planet. In the end, it was an extraordinary effort at international diplomacy. Supporters of a deal argued that no less than the future of the planet was at stake, and in the days leading up to the final session, they worked relentlessly to push skeptical nations to join their ranks. As they headed into the cavernous hall late Saturday, representatives of individual countries and blocs publicly expressed their support for a deal that had been hammered out down to the wire in a final overnight session on Friday. The United States, which has been a leader in the negotiations, said it approved of the pact, as did the European Union, Canada, Australia, Brazil, Germany, Japan, the Marshall Islands and the 143 countries that make up the G77. At the heart of the final deal is a breakthrough on an issue that has foiled decades of international efforts to address climate change. Traditionally, such pacts have required developed economies, such as the United States, to take action to mitigate greenhouse gas emissions, but they have exempted developing countries, such as China and India, from such action. The new accord changes that dynamic by requiring action in some form from every country, rich or poor. The echoes of those divides persisted during the negotiations, however. Delegates were presented with the final draft of the document Saturday afternoon, after a tense morning when the text was promised but repeatedly delayed. They immediately began parsing it for language that had been the subject of energetic debate in preparation for a voice vote on whether the deal should become law. The accord was heralded by three leaders — Foreign Minister Laurent Fabius of France, President François Hollande and Secretary General Ban Ki-moon of the United Nations — who helped shepherd it through the final phase of a two-year effort to forge commitments to lowering the rate in which carbon emissions are released into the atmosphere. Before the text of the accord was released, the three urged all delegates to seize the opportunity for enormous change, and Mr. Fabius, who has presided over the assembly, made an emotional appeal. “Our text is the best possible balance,” he said, “a balance which is powerful yet delicate, which will enable each delegation, each group of countries, with his head held high, having achieved something important." "Grand promises of Paris climate deal undermined by squalid retrenchments". Full text of the agreement . Organisers of the climate talks in Paris say a final draft text has been agreed after nearly two weeks of intensive negotiations. An official in the office of French Foreign Minister Laurent Fabius told the AFP news agency the draft would be presented to ministers at 10:30 GMT. No details of the proposed agreement have been released so far. The tentative deal was reached nearly 16 hours after the talks had been scheduled to close. "We have a text to present," the official said, adding that the draft would be now translated into the UN's six official languages. Analysts say that this is not a done deal - ratification will only take place if there are no objections raised at Saturday morning's ministerial meeting, and even this is unlikely to come before afternoon in the French capital. Mr Fabius, who has presided over the talks, had said earlier that the "conditions were never better" for a strong and ambitious agreement. COP21 Live: Day 12 as it happened. Significant progress had been reported on a range of issues, with evidence of real compromise between the parties, the BBC's environment correspondent Matt McGrath in Paris reported earlier. He added that countries supported a temperature goal of 2C but agreed to make their best efforts to keep the warming rise to 1.5C. However, the language on cutting emissions in the long term was criticised for significantly watering down ambition. The question of different demands on different countries, depending on their wealth and level of development - called "differentiation" at the talks - was said to be the root cause of the difficulties. Another major difficulty was transparency - richer countries want a single system of measuring, reporting and verifying the commitments countries make as part of this agreement. It is said to be crucial to the US, which wants to ensure that China is subject to the same sort of oversight as it is. China and India are not keen on this type of oversight. We're in the final hours. French Foreign Minister Laurent Fabius has been meeting in huddles with key players throughout the night, hammering out a compromise. But there was serious opposition to the previous draft and it's too soon to say how much of that the new document will have defused because delegates will be seeing it for the first time this morning. It's a UN process so any deal has to be signed off by everyone and that gives disproportionate power in the final last few hours for any nation wanting clauses inserted or removed. One positive note came with the announcement that Brazil was willing to join the so-called "high-ambition coalition" of countries including the EU, the US and 79 countries. The alliance said it would push for an ambitious and legally binding deal with a strong review mechanism. US President Barack Obama spoke to his Chinese counterpart Xi Jinping by phone on Friday, with both leaders saying they were committed to an "ambitious" deal. "Both leaders agreed that the Paris conference presents a crucial opportunity to galvanise global efforts to meet the climate change challenge," a White House statement said. "They committed that their negotiating teams in Paris would continue to work closely together and with others to realise the vision of an ambitious climate agreement." BBC News Saturday 12 December. Le Bourget (France) (AFP) - Sleep-deprived ministers tasked with saving mankind from a climate catastrophe headed into a second night of non-stop talks on Thursday, battling to overcome a rich-poor divide in search of a historic accord. Eleven days of UN talks in Paris have failed to achieve agreement on key pillars of the planned post-2020 climate pact, aimed at sparing future generations from worsening drought, flood, storms and rising seas. After all-night negotiations failed to mend the rifts that have endured for more than two decades, French President Francois Hollande stepped in on Thursday morning, seeking to inject a sense of urgency. "It is important in this last phase that we remind the negotiators why they are here," Hollande said. "They are not there simply in the name of their countries... they are there to sort out the issue of the future of the planet." The Paris accord would rally 195 nations in a quest to roll back emissions of fossil fuels -- which warm the Earth's surface and affect its delicate climate system -- and channel billions of dollars in aid to vulnerable countries. In a sign of the difficulty and complexity of the talks in Le Bourget on the northern outskirts of Paris, carefully-crafted timetables began to slip Thursday, with the release of a planned new draft delayed twice and by a total of six hours. French Foreign Minister and conference host Laurent Fabius said he was still aiming to forge the historic deal by Friday's scheduled close. "I hope, I hope that tomorrow we will have finished," Fabius said. But others were less sure, with senior Chinese climate envoy Li Junfeng telling reporters he thought a Saturday finish was the best-case scenario. A second night of negotiations were scheduled for Thursday to debate the planned new text, although this had still yet to be released by dinner time. As part of a carefully coordinated US diplomatic push for a deal, US Secretary of State John Kerry met Thursday with Indian Environment Minister Prakash Javadekar, a key player in Paris because his country has huge coal resources that it wants to burn to power its economic development. "We want future generations to get a right and good deal from Paris," Javadekar said after talking with Kerry. On the sidelines, a host of nations from all sides of the disputes continued to voice entrenched positions. Still, delegates said that the mood was still positive, and the finger-pointing and back-biting of past climate talks were so far absent. Developing nations insist the United States and other established economic powerhouses must shoulder the lion's share of responsibility as they have emitted most of the greenhouse gases since the Industrial Revolution. Rich nations say emerging giants must also do more, arguing that developing countries now account for most of today's emissions and thus will stoke future warming. One of the battlegrounds is what cap on global warming to enshrine in the accord, set to take effect in 2020. Many nations most vulnerable to climate change want to limit warming to no more than 1.5 degrees Celsius (2.5 degrees Fahrenheit) compared with pre-Industrial Revolution levels. However several big polluters, such as China and India, prefer a ceiling of 2C, which would allow them to burn fossil fuels for a while longer. There was growing confidence within the vulnerable-nation bloc that they would win their high-profile campaign, and secure a reference to the 1.5C target in the key "purpose" section of the planned accord. This was partly due to the emergence of an informal new lobby group that emerged this week in Paris dubbed the "High Ambition Coalition" that included the United States, the European Union and many vulnerable nations. The group does not negotiate as a bloc, but has been seen to have had influence in the talks by heavily promoting "ambitious" benchmarks in the planned accord, such as a 1.5C reference. One of the biggest potential deal-busters remaining is over money. Rich countries promised six years ago in Copenhagen to muster $100 billion (92 billion euros) a year from 2020 to help developing nations make the costly shift to clean energy, and to cope with the impact of global warming. But how the pledged funds will be raised still remains unclear -- and developing countries are pushing for a promise to ramp up the aid in future. Another flashpoint issue is how to compensate developing nations that will be worst hit by climate change yet are least to blame for it, as they have emitted the least greenhouse gas. Most nations submitted to the UN before Paris their voluntary plans to curb greenhouse gas emissions from 2020, a process that was widely hailed as an important platform for success. 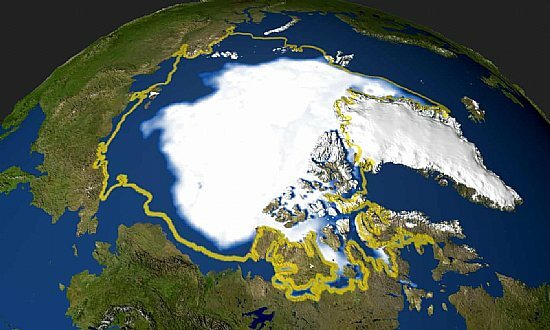 But scientists say that, even if the cuts were fulfilled, they would still put Earth on track for warming of at least 2.7C. Negotiators remain divided in Paris over when and how often to review national plans so that they can be "scaled up" with pledges for deeper emissions cuts. It will be the 21st yearly session of the Conference of the Parties to the 1992 United Nations Framework Convention on Climate Change - nothing to do with the last climate conference in Copenhagen, which is probably best forgotten. According to the organizing committee, the objective of the 2015 conference is to achieve, for the first time in over 20 years of UN negotiations, a binding and universal agreement on climate, from all the nations of the world. As the UN’s climate talks in Paris begin, the lobbying and public relations push from some of the biggest corporations responsible for climate change has gone into overdrive. What are the messages they’re so keen to spread, and what will they mean for the COP21 conference – and for the climate? A recent report from the NGO Corporate Europe Observatory reveals that what’s on offer at COP21 is nothing short of a climate catastrophe, a guaranteed recipe to cook the planet. But rather than sending the dish back, political leaders have asked for seconds, bringing the very companies responsible for the problem ever closer into the UN fold. Fortunately the UN agrees. The problem, however, is that is has also succeeded in creating several platforms to ensure business-friendly proposals are at the heart of climate policy-making, rather than vice versa. New markets, experimental technologies, all endorsed so polluters don’t have to change their business models. The UN’s climate chief, Christiana Figueres – who before taking up her post was principal climate change advisor to Latin America’s leading energy utility, Endesa – has even told the world to “stop demonising oil and gas companies”. "How the private sector is powering a low carbon revolution" - DECC. DECC - the Department of Energy and Climate Change - is promoting a website publicising activities by a range of private sector companies intended to limit energy use and reduce carbon emissions.